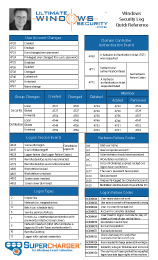 The user in Subject: added the user/group/computer in Member: to the Security Local group in Group:. In Active Directory Users and Computers "Security Enabled" groups are simply referred to as Security groups. AD has 2 types of groups: Security and Distribution. Distribution (security disabled) groups are for distribution lists in Exchange and cannot be assigned permissions or rights. Security (security enabled) groups can be used for permissions, rights and as distribution lists. A domain local group means the group can only be granted access to objects within its domain but can have members from any trusted domain. (According to Microsoft Account Name [Type = UnicodeString]: distinguished name of account that was added to the group. For example: “CN=Auditor,CN=Users,DC=contoso,DC=local”. For local groups this field typically has “-“ value, even if new member is a domain account. For some well-known security principals, such as LOCAL SERVICE or ANONYMOUS LOGON, the value of this field is “-”.